HELLO to this terrific card!! Happy Thanksgiving! Happy Thanksgiving Amy...I love that fabric HA stamp...one of my all time favorites and you rocked it! Awesome job Amy!!! LOVE it!! TFS and have a very Happy Thanksgiving!! Your card is beautiful Amy. Love when you do the tag/cards. Wishing you and your family a Happy Thanksgiving. This is just gorgeous my friend!! I loveeeeeeeeeeeee the colors and those flowers!! Happy Turkey Day!!! Beautiful design, Amy! Happy Thanksgiving to you & your family! lots of stamping on this and it is just beautiful. Your fussy cutting is perfection! I thought that was a die cut! 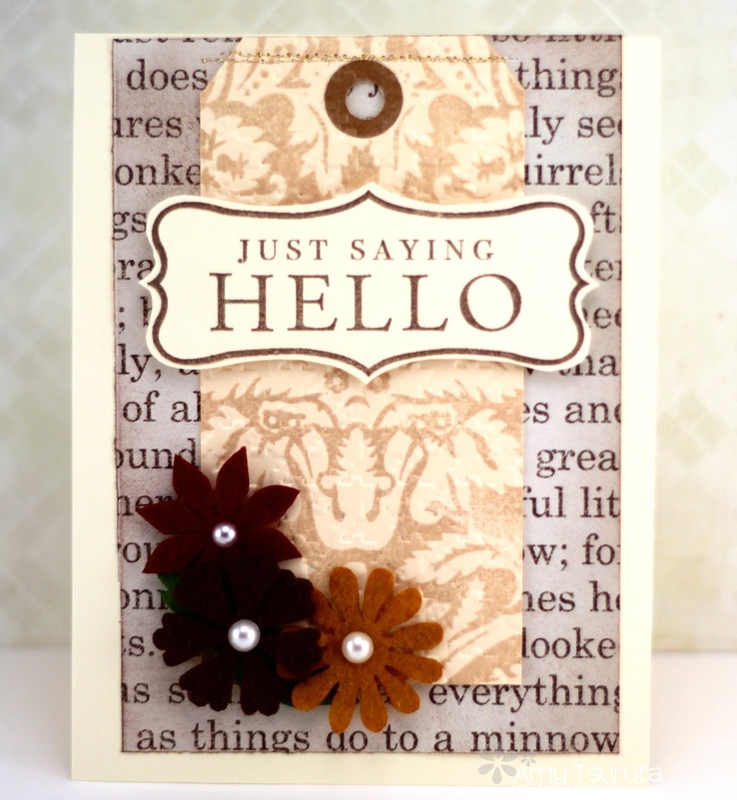 Fabulous card, Amy, love the color tones you used here! Have a wonderful Wednesday and Thanksgiving! Love the pretty fall tones on this! Very nice card! Holy Cow! This is stunning, Amy!! Soooo love the stamping, embossing, flowers, and that yummy yummy neutral color palette! Totally up my alley! Wishing you and yours a very wonderful Thanksgiving tomorrow! sooo pretty!!! LOVE the colors!!! You are just way too sweet Amy! It really made my day to recieve your e-mail - thank you so much! I know you know how much I adore this card - so super beautiful! BIG hugs from a very happy Karin! Gorgeous card Amy and definitely Karin's colours :) Have a fabulous long weekend and Happy Thanksgiving. Amazing card, and happy thanksgiving! LOVE this Card Amy!! Happy Thanksgiving !! Wow Amy! This is fabulous. So many little details. I love it. Stunning... now I think I have that Hero Arts sentiment...somewhere. Just posted your Cub Scout craft project photo, for you! Happy Friday to you, have a great day!!!!! Love all the great texture & warm colors! Love the houndstooth embossing! I was so excited to get that folder because I love houndstooth, but I never end up using it because the big pattern always looked busy on my plain cardstock. But using it on the patterned paper like you did works really well. Thanks for the idea! Finally getting a chance to catch up on blog posts, and wanted to thank you so much for your words of sympathy on my blog last week. They really mean a lot to me! what a beauty! gorgeous card, Amy!